The wildfires that continue to affect California have caused widespread, devastating damage and forced thousands to leave their homes. Many across the state are still recovering from the effects the wildfires have had on their homes and communities. 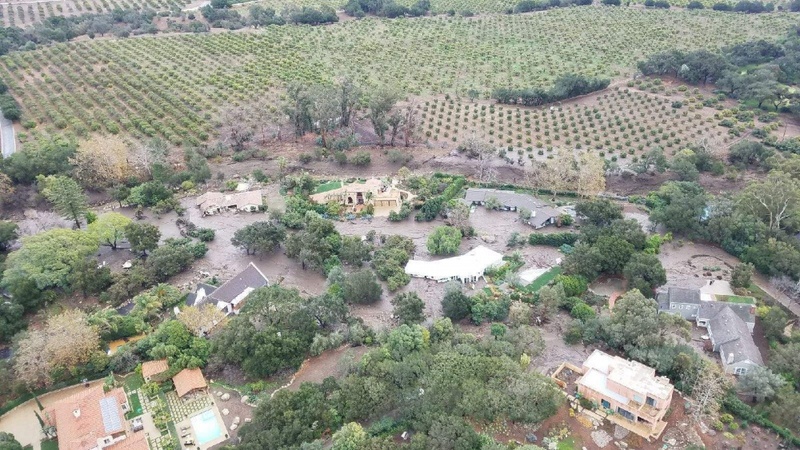 As if the wildfires themselves weren’t bad enough, they have created a new, deadly disaster that has already claimed lives in California, mudslides. Mudslides are extremely dangerous disasters that can threaten your life and your property. If your area becomes threatened by mudslides, it is very important to follow these mudslide preparation and safety tips to protect yourself. Mudslide affects Santa Barbara County neighborhood. The California wildfires burned trees and bushes across large forested areas which helped create the conditions for mudslides. Without plant life to contain the flooding and the mud, dangerous mudslides can occur and affect entire communities. It only takes a little bit of rainfall to cause a mudslide in these conditions. Watch out for warnings of rain or thunderstorms if your area is at risk for mudslides. Make sure your phone is charged in case you need to call emergency responders. Pay attention to emergency information and make sure you know the evacuation plan for your community. Document your property with photos and videos before experiencing any damage. If time allows, consult a landscaper about how you can best protect your property from mudslides. If mudslides are likely to occur, you can use sandbags to divert the slide away from your property. Many California residents can get free sandbags from local fire stations. Listen for the sounds of a mudslide, such as rumbling, rocks crashing together, and cracking tree branches. Use extreme caution on the roads, especially if the road is on sloped land. Listen for information from authorities regarding the severity of the situation and whether it is best to evacuate the area. Be ready to evacuate so that if the order of evacuation is given, you can leave without wasting any time. Make sure you have an emergency kit already prepared with the supplies you and your family will need. Your top priority in the case of a mudslide is to protect yourself and your family. Protecting your property is also important, but this should never come at the expense of your own safety, especially when dealing with a disaster as dangerous as a mudslide. Those who live in areas threatened by mudslides must prepare before the disaster occurs so they can evacuate as soon as they are in any danger. If your property sustains damage from a mudslide or major flooding, there are restoration professionals who can help. Mudslides can cause physical damage to homes and buildings, and the mud also contains moisture that can worsen the damage and cause mold growth. A disaster restoration professional can help remove the mud and water as well as provide complete flood drying services to remove excess moisture from affected materials. If your home or building experiences structural damage from the mudslides, restoration professionals can also provide construction services to help rebuild the damage. Regardless of how much damage a mudslide causes to your property, calling a restoration professional as soon as possible will help prevent the damage from getting worse.